Arab arrested with knife in bag on his way to Damascus Gate, admits to police he planned to attack. 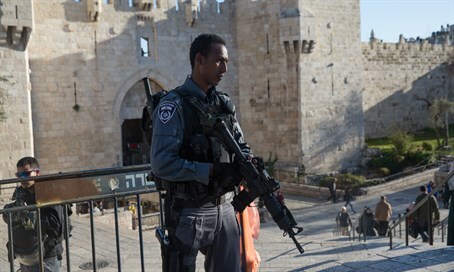 A stabbing attack was prevented by alert Border Police officers in Jerusalem on Friday, as they arrested an Arab terrorist on his way to the Damascus Gate of the Old City. The terrorist, aged around 25, aroused the suspicions of the officers as he walked along Hanevi'im Street towards the Damascus Gate. The officers checked him and his belongings, and in his bag they found a large knife. Police revealed the terrorist was a resident of Judea and Samaria who had entered sovereign Israeli territory without a permit. He was brought in for investigation, where he admitted that he had arrived with the goal of conducting a stabbing attack and had even bought a knife for that very purpose. The commander of the Kedem district which includes the area of the arrest praised the alert officers, noting, "the results of the operational deployment is made known in every incident." "Identifying the anomaly and approaching to make contact prevented an attack and harm to innocents," added the commander.